You don’t have to go very far to enjoy flavors from around the world! On Saturday, October 6 from 11am to 4pm you can enjoy an International tasting experience in Saratoga Springs! Feast on flavors from a variety of countries including France, China, Japan, Italy, Mexico, and America, among others, making this food event one of its kind! 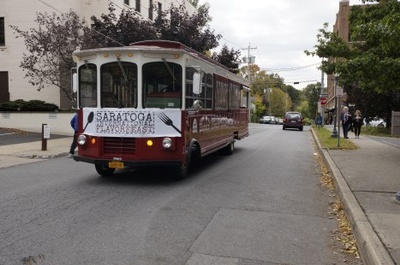 The Saratoga International Flavorfeast is a celebration of the worldly culinary styles that give this area its unique flair. It presents a feast for the senses and reflects the multicultural diversity of the Region. And it’s held in the heart of Saratoga Springs. With something for everyone, you will see students, families, senior citizens and young professionals enjoying authentic dishes from foreign lands. Admission to Flavorfeast is FREE, where you can sample international dishes from various participating restaurants in downtown Saratoga Springs, NY for $1 a sample.